*** This article was updated 8 October 2018 to incorporate a point I missed in the convoluted bus affair. My apologies; the affair is complicated enough without me missing a key factor from this part of the account! The 1925/6 season ended with the country in absolute turmoil with the general strike starting on 3 May, and the BBC then taking the unprecedented step of broadcasting five news bulletins a day as no newspapers were available. On 9 May martial law was introduced into Britain, and the following day talks began between the government and strikers, with the strike ending on 12 May. By the time the strike was over the Arsenal team had left England for their tour of Budapest, Prague, Innsbruck and Vienna, although it should be noticed that the team did not play a match during the general strike. Only three of the matches had crowd totals recorded and these were all decent numbers, reflecting an interest in English football, and in the club that had just come second in the league. The regular players from throughout the season turn up in the team details which are available with just two new names appearing: Lee playing five games at outside left and Bowen playing one game (and scored a goal) at centre forward. “Lee” on the teamsheets was John Lee known as “Jack” who was signed on 4 May 1926 – (thus just before the tour began) from the junior side Horden Athletic. He made his debut for the 1st team in the league on 6 September 1926 and played seven times in the season, but then played no more for Arsenal. He was transferred to Chesterfield on 7 June 1928. Eddie Bowen had joined the club earlier in the season, on 15 February 1926 from Wath Athletic and played just one game for the first team (against Bury on 4 May 1927) before moving to Northampton Town on 1 February 1928. Wath Athletic was a club from the Sheffield area, which continued to play until just before the start of the second world war. Here are the results from the post season tour, courtesy of TheArsenalHistory website. Looking back on Chapman’s first season at Arsenal, one of the key issues of course is that of the players at Chapman’s disposal. How many new players did he bring in? What evidence is there that Knighton was restricted in his purchase of players, whereas Chapman could buy anyone he liked? In short, was Chapman working with Knighton’s squad, or did he transform the team in order to transform the results? And this is a key issue when we seek to judge Knighton’s contribution to the club. The last season had ended with Arsenal one place away from relegation, while the very next season Chapman had taken the team to second. Was the reason because Chapman had spent money on players that was never made available to Knighton, or was Chapman working with the same team but with superior tactics? To answer this I’ve drawn up a list of all the players who played in Chapman’s first season (columns two and three) and compared it with Knighton’s last season (columns four and five). The players not used in Knighton’s last season are shown in bold. *Players with an asterisk were at the club in 1924/5 but did not get a game – while all got at least one game under Chapman. Leaving aside the players who played four games or fewer in 1925/6 but who had not played at all in 1924/5 although being at the club (Paterson, Rutherford, Seddon, Voysey) we have five players who were new to the team. Four of these were purchased by Chapman: Buchan, Harper, Hulme, Parker, and one (Seddon) who had been brought to the club by Knighton, but not given a game. Of the four purchased by Chapman, Parker had a minimal impact having joined at the end of the season playing just seven games, so in effect there were, through the season just three new players. Now I would not want to play down the impact of these players – in particular Buchan – but it does make the point that Chapman did not walk in, have access to an open cheque book, and then spend money. He brought in three players whom he used through the season and that was it. So, let’s consider them. First, Buchan, whom Chapman clearly wanted and who it appears was ready to leave Sunderland, and who had an enormous impact. Second Harper, the Scottish international goalkeeper who joined in November 1925, and third Hulme who joined in February 1926. All three were clearly important, but this was clearly not a case of Chapman making wholesale changes to the team. Indeed the team he picked up to the end of October was a team that (aside from one player) was available to Knighton – and which by the end of the month was fourth in the league. From there on he added a handful of players, but primarily it was clearly Chapman’s coaching and his approach to tactics, plus a certain level of stability he brought to the team, which took the club from near relegation to nearly a title. In particular what Chapman did far less often than Knighton, was play members of his team in different positions. We have seen newspaper comments from earlier seasons in which the journalists criticised Knighton for swapping his first team around and playing them out of position, rather than make use of perfectly decent men who were playing in the reserves. Chapman did little of this positional swapping. Certainly the statistics bear this out to some degree with seven players turning out for Arsenal in 1924/5 in different positions at different times. Chapman’s total seems at first only a little lower (five) but two of these were Lawson and Hulme, who swapped positions towards the end of the season – thus adding two to Chapman’s total through one tactical change. But above all, what Chapman did was turn Jimmy Brain into a record breaking goalscorer, getting an amazing 37 goals in 47 games. (Buchan playing in the less attacking inside forward position got 20 in 45 games). But now moving forward into the summer, there was a minor amount of work at Highbury, some transfer activity and the tour. At Highbury the cinder track around the edge of the pitch was added, and some further work was undertaken on the grandstand – which also had a repaint. On the transfer front the newspapers reported that Arsenal attempted to sign Jimmy Ruffell who had been at West Ham since 1920, and who played as a winger who could score goals. He had been in the West Ham team that made it to the Cup final in 1923, however the deal came to nothing. Meanwhile it was decided by Arsenal to buy a new team bus for the reserve team, and the old one was put on sale at a garage in Upper Street. It was sold by the end of July. And at this very moment something odd was arranged because Sir Henry Norris gave Harry John Peters, the office manager at Arsenal a note, authorising Peters to debit Norris’ bank account with the £170 for the sale of the Arsenal reserve team bus. That is to say, from the very start of this affair, it seems that Sir Henry had arranged for himself to deal with the bus personally, to take the money from the sale of the bus, and for himself then to pay the money over to the club. Having studied the bus affair subsequently for rather more time than is good for my health, I am rather bemused by this. The only explanation I can think of is that when the bus was first purchased, it was purchased directly by Henry Norris and loaned to the club, or rented to the club at zero cost. By this time, with the general strike over there were many changes afoot. Newspapers had shut down during the strike, and many did not reappear – at least in their previous form. The Islington Daily Gazette did return, but only on three days a week. During the summer there was no attempt to publish any football news, and when it did pick up on he sport again, it appeared that Arthur Bourke who wrote as Norseman was no long part of the show. The paper paid no final tribute to him, and I feel we should do so here, for he was quite an unusual man, and despite his criticism of the club in print, a solid supporter at all times. Unlike many other journalists of the era Arthur Roston Bourke (1866-1955) did not start out in that trade, but was a referee of great renown also had his own football team known as the “A. Roston Bourke’s XI”. Also in 1892 he joined the London Football Association Council and was asked to organise teams of London players to oppose clubs at some distance from town – hence the formation of “A. Roston Bourke’s XI,” whose games we have recorded elsewhere on this site. It is not clear when he joined the Islington Daily Gazette, but he was certainly commenting on Arsenal from 1919 until the reduction in the output of the paper after the general strike. At the end of May 1926 the agenda for the League’s AGM was published. For the final time Arsenal put forward a set of ideas to control the transfer market including moving the transfer deadline back from the end of March (as it was at this time) to December. Arsenal (which undoubtedly meant Sir Henry Norris) proposed the extension of the “Cup tied” arrangement for transferred players to league games for the same season, and that the three year wait for a benefit match rule should be abolished. I suspect that latter proposal may have been introduced to help Charlie Buchan! And then in June 1926 (the exact date for some reason not being recorded) Arsenal did a deal every bit as important as singing Buchan, Parker or Brain. They signed Jack Lambert from Doncaster Rovers for £2000. His importance can be seen from the fact that he went on to score 98 goals in just 143 league matches – plus another 11 in 16 games in the Cup. Lambert had played 1925/6 season at Doncaster scoring 13 in 44 games, and he took a few years to get going at Arsenal, but when he did he was an absolute sensation scoring 38 goals in 34 games in 1930/1. After retiring from Arsenal he worked at the nursery club Margate and in 1936 was their player manager. Tragically he died at the age of just 38, in a car accident in Enfield on 7 December 1940. Returning now to the summer of 1926, on 7 June the Football League held its AGM which was of course covered by Athletic News. Sir Henry Norris does not appear to have been at the meeting – another sign of him now removing himself from the daily engagement with all things football. Sir Henry’s proposals for changes to the transfer rules had met with no success in earlier times, and without him there there was no chance of the changes being taken up for the same reason as always. High transfer fees benefitted the selling club – which meant the directors – and gave the club another source of income. Restricting these while removing the maximum salary (as Sir Henry proposed) only benefited the players, not the clubs, and so the clubs would never accept the move. However a motion was passed saying that buying clubs were forbidden from paying for transfer fees over time unless they had special permission. The reason was to stop any further Buchan style deals in which players were paid for the number of goals they scored. Meanwhile the Arsenal reserve team bus had been sold, and on 7 July James MacDermott arranged for a cheque payable to Arsenal FC to be given to the club. But as we have noted above, Sir Henry had already given instruction that money should move from his personal account to the club for this sum. According to one account Herbert Chapman took the cheque and handed the cheque over to Sir Henry when he next saw him. However Chapman later denied that he ever saw the cheque. There seems to have been an understanding that the money from the sale of the bus would then go to pay part of the fee owing to Buchan for his £100 a goal activities – which was of course perfectly legitimate use for the money. But there is no record of this, and besides with the club taking £170 from Sir Henry’s account it was Sir Henry who should have the money. On 9 July the annual accounts of Arsenal showed that the club now did indeed own Highbury and that the land was worth £48,109, with the house in Hendon where Herbert Chapman and his family lived, (also owned by the club) being worth £3819. Both Highbury and the house were being bought via repayment mortgages of the type still common with building purchases today. The report also shows that William Hall owned 414 Arsenal shares and Henry Norris 412. Having been selling Arsenal shares for many years to raise money, they were now buying any that were offered on the market. On 17 July it was reported by the buyer of the reserve team bus that Arsenal had not yet paid the cheque he had given the club, into its bank – his concern presumably that the cheque had got lost or that the club might be changing its mind over selling the bus, or about the money paid for it. He was told that the cheque had been given to Herbert Chapman who would be paying it into the bank shortly. Now what I would say, as we go through this, is that one of the tests to apply in cases in which one is trying to establish not only what happened, but the motives behind it one has to consider the background. And in all this, we have to recognise that Sir Henry was extremely wealthy (he certainly didn’t need the proceeds of the bus sale – had he done so he would have purloined the money long before, not left the cheque uncashed), and extremely successful. Nothing in any of the reports suggest that he had any reason to want the money for himself. He also had a continuous income stream from the properties he owned in Fulham. The 2018 equivalent of the £170 in 1926 is £5808, and Sir Henry certainly did not need £5800. In short he had absolutely no need to remove money illicitly from Arsenal. But let us consider another fact. As noted – the cheque would not be lost or returned to him – it would go back to the person who wrote it. So Sir Henry’s activity in signing the cheque in Chapman’s name has several points linked to it. First, a man of Sir Henry’s long running business acumen (remembering he set up his business that man him so wealthy, from nothing) would know exactly what would happen to the cheque. Second, he could have laid his hands on the money needed at any time during the working week by getting his chauffeur to drive him to a bank. Third, he had had the cheque in his wallet for two weeks without paying it in. In short, Sir Henry if the money was not his, he would have known that the money was not his and would have known he would be found out in handing the cheque to his wife to clear her bank account. And he didn’t need for money at all – quite the reverse. So what possible explanation can be given for this activity – other than the fact that the money was his (perhaps because the coach had actually been in his name), and he had already instructed the club to take £170 from his personal account into the club account. I can’t think of any other explanation. Whether that was a permanent condition for him or temporary is hard to say, but anything other approach gives us a result that was not that of a rational man. Once the fact about the order to take £170 from Sir Henry’s account and pay it to Arsenal is removed nothing makes any sense at all, for the resultant scenario is not one that reveals the act of the man who could run a 16 year project to turn a bankrupt south London team, into the club getting the biggest crowds in the country. Meanwhile the Islington Gazette (no longer the Daily Gazette) appointed an Essex cricketer as its Arsenal correspondent to replace Arthur Bourke, and he wrote under the name St Ivel. Apparently he was friends with Herbert Chapman. Next on 25 July, the BBC moved its most powerful transmitter from Chelmsford to Daventry, where it still stands today broadcasting on 198m long wave. It had near national coverage and became the transmitter for the BBC National Programme. Back with Arsenal, the club sold on two players. On 6 August Harry Woods was transferred to Luton. Although he had played regularly under Knighton, Chapman did not use him at all, and he moved on after a season in the reserves. Then on 6 August John Clack, who had transferred to Arsenal from Bo’ness was transferred to Luton after a total of six appearances. 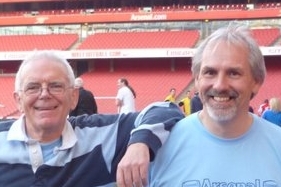 On 18 August the Miners’ Federation began to negotiate with the government and by now Arsenal would have been preparing for the new season. There were no pre-season friendlies noted by the club, but we may presume that on 14 and 21 August Arsenal held the Reds v the Blues matches at Highbury, in which effectively the first team played the reserves. Finally on 28 August 1926: Chapman’s second season began with a 2-1 victory over Derby County with Buchan and Parker scoring in front of 32,990. The runner’s up from last season were looking to go one better.